Yellow Hair documents the injustices done to the Sioux Nation from their first treaty with the United States in 1805 through Wounded Knee in 1890. Every death, murder, battle, and outrage written about actually took place. The historical figures that play a role in this fact-based tale of fiction were real people and the author uses their real names. 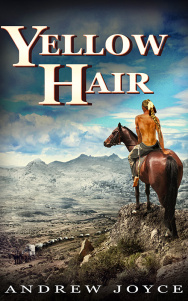 Yellow Hair is an epic tale of adventure, family, love, and hate that spans most of the 19th century. Andrew Joyce is the recipient of the 2013 Editor’s Choice Award for Best Western for his novel, Redemption: The Further Adventures of Huck Finn and Tom Sawyer. Fantastic story, an educational as well as interesting read! Hey! Avery is studying Native American culture right now. We will look this up!